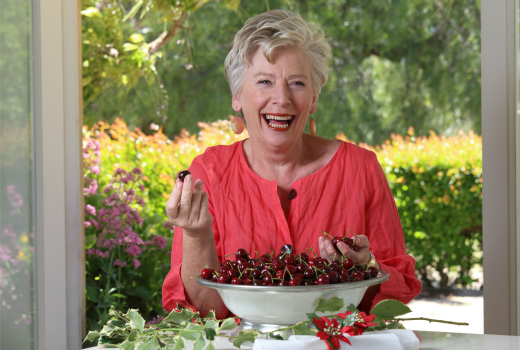 If there’s anyone who can get us in the mood for a hearty Christmas feast it’s Maggie Beer, who has a tasty special set to air on ABC1 later this month -chockful of Australian produce, of course. To celebrate the festive season Maggie Beer invites some special guests to the ultimate Australian Christmas feast in the beautiful surroundings of her own property in the Barossa Valley. Maggie’s menu is inspired by her own family Christmas celebrations. There are two absolute traditions on the Beer family table. Yabbies from the dam, served outside and eaten using fingers, and a goose in the centre of the table. Maggie adds a perfectly glazed ham, slow-roasted lamb, pork, char-grilled beef, some fish and oysters, all accompanied by a variety of salads. Top this off with a special surprise recital while three stunning desserts and a variety of local cheeses are served in the ‘top shed’ and this is a feast not to be missed.